A presence in West Texas and Eastern New Mexico since 1957, the familiar yellow and black Kent Oil shield has helped make life easy for thousands of customers in over 80 locations. In the 1970s, the company moved away from the familiar style service station concept into convenience stores selling thousands of products. The last Kent Oil Service Station was torn down and built into a new Kent Kwik Convenience Store in the early 1980s. Today Kent Kwik is a major brand providing quality products and services to West Texas customers. The Howard Company/Mainstreet Menus was the menu board supplier for their store outlets. Kent Oil management contacted us about updating their store locations with new indoor and drive-thru products. The Howard team used a site evaluation approach to determine store layouts and to determine what solutions might fit their needs. The convenience stores were looking to make improvements to the indoor menu board signage plus research drive-thru options as they looked to expand not only their food service to a drive-thru lane, but for store patrons to be able to purchase any manner of goods and have them delivered through their pick-up and pay window. The Midland, Texas, test location was chosen to upgrade from static menu boards to digital menu systems over the food center and the beverage station for the interior upgrade, and a full drive-thru lane was planned including an order station canopy, drive-thru menu board, and Techknow order confirmation kiosk on the outside of the store. The goal was for Kent Kwik to be able to operate their drive-thru lane 24 hours a day. The Howard production crew worked with Kent Kwik’s team to deliver all products to meet their installation schedule and timelines. Our digital staff communicated with Kent’s tech team remotely to assure correct installation of the digital systems. The Midland site was able to be up and running with Howard equipment on the first day of operation, happily meeting Kent’s expectations. “Thank you so much!! Everything looks great. I can't wait to play with it!” said Stormy Williams, member of the Kent Oil management team. 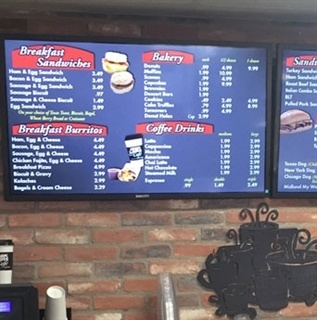 Kent Kwik utilizes a digital drive-thru menu board for customer convenience 24/7! 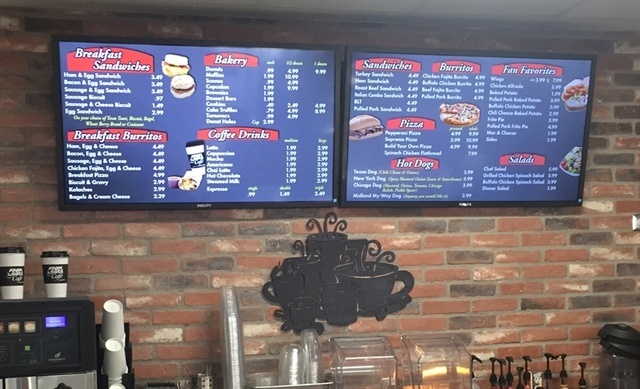 Pleased with the appearance and ROI of the test store, Kent Kwik is moving forward with complete store packages including indoor digital menu systems and drive-thru lane products for both remodel locations and new station builds. The Howard created the digital display content in-house, with future plans for store management to self-administer updates and content creation. The Howard Company once again provided quality solutions in a timely manner that met the needs of our business partner!